The 1960s were a time of upheaval in all corners of American culture, not the least in music. Lyricists such as Bob Dylan, Paul Simon, Curtis Mayfield and Lou Reed were revolutionizing songwriting by introducing new subject matter and literary techniques. Instrumentalists such as John Coltrane, Ornette Coleman, Bill Evans and Charles Lloyd were upending all previous notions of harmony and rhythm. Looking back, it seems strange that these two areas of innovation never merged. Occasionally a jazz soloist would sit in with bands such as Steely Dan and Grateful Dead, and jazz bands would sometimes cover the songs of Dylan and Simon. But you never had a major lyricist recording and touring with a true jazz band on an equal basis. Joni Mitchell did make a pair of studio records (Don Juan’s Reckless Daughter and Mingus) with Weather Report’s Wayne Shorter and Jaco Pastorius, and Sting made three (The Dream of the Blue Turtles, …Nothing like the Sun and The Soul Cages) with Branford Marsalis and Kenny Kirkland. But the albums were credited to Mitchell and Sting alone—and rightly so, for the jazz musicians were clearly sidemen and not full partners. That’s what makes the new album, Vanished Garden, such a milestone. 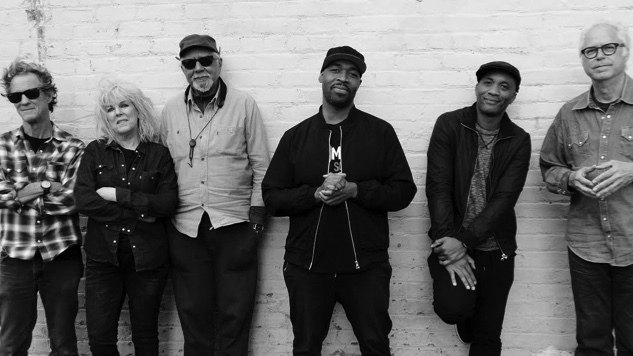 Not only is it credited to “Charles Lloyd & the Marvels + Lucinda Williams,” but the music within represents a true collaboration between the jazz musicians and the singer/songwriter. You can hear the saxophonist and his musicians respond to Williams’ words and melodies, and you can hear the vocalist react to the ever-shifting harmonies and rhythms beneath her. The collaboration is not compartmentalized into the jazz musicians cutting loose on the solos and the Americana musicians stepping forward in the vocal sections; it’s integrated from start to finish. Williams sings three of her older songs, a new original and Jimi Hendrix’s “Angel.” The Marvels add five instrumentals, and the result is one of the year’s best recordings, a long-delayed fulfillment of the wish to pair an important Americana songwriter with a working jazz band. This is important, because it brings two currents of innovation into the same river, to prove that challenging lyrics can be bolstered, not obscured, by challenging music—and vice versa. The stumbling blocks were not just music-industry opposition. Adding a singer to a band is not the same as a trumpeter or conga player, because you’re adding more than just a new sound; you’re adding a whole new artistic element: words. Just to make the words heard require the musicians to pull back and step forward at just the right times. If the words are strong, they demand as much attention as the music—and this presents a challenge not only for the listener asked to keep track of both at the same time but also to the singer or soloist asked to cede some of the spotlight. And if the words are tethered to repeating rhythmic and melodic sections, that presents a challenge to jazz musicians who prefer more flexible forms. It happened this time due largely to Bill Frisell, a guitarist firmly rooted in the jazz world (where he has worked with the likes of Ron Carter, Joe Lovano and Paul Motian) but also a musician who has crossed genre boundaries to work with Elvis Costello, Bonnie Raitt and Rickie Lee Jones. Frisell’s frequent sidekick is steel guitarist Greg Leisz, best known for his work with such Americana artists as Dave Alvin, Emmylou Harris, Joni Mitchell and Jackson Browne. “I was playing with Charles in Montreal,” Frisell remembers, “and he was talking about growing up in Memphis with the sound of a slide guitar.” Lloyd had backed up Howlin’ Wolf, who used a slide guitarist, and had befriended steel guitarist Al Vescovo. “When I played in West Memphis as a teenager,” Lloyd recalls, “the group that went on before us was the Snearly Ranch Boys, a white country band. Al was their steel guitarist, but he liked Duke Ellington and ‘Honeysuckle Rose.’ I thought that was strange, so I talked to him and we became friends. Al and I spent so much time together, that people thought something funny was going on. Lloyd had created the Marvels so he and his regular rhythm section (drummer Eric Harland and bassist Reuben Rogers) could play with Frisell and Leisz. That line-up’s first album, 2016’s I Long To See You (featuring vocals by Willie Nelson and Norah Jones), was released the same year as the third collaboration between Frisell, Leisz and Williams: The Ghosts of Highway 20. It was almost inevitable that Lloyd and Williams would meet via Frisell and Leisz. The first recorded collaboration between Williams and Lloyd was a 2017 single, a live version of Dylan’s “Masters of War.” Maybe Lloyd never got a chance to record with Dylan, but here was a chance to record one of the latter’s best protest songs with one of Dylan’s most obvious heirs. Lloyd had already recorded an instrumental version with the Marvels on their debut album. Lloyd’s tenor saxophone starts answering each fire-and-brimstone line with a moan of affirmation, as if he were in the congregation of a Southern African-American church responding to a preacher. Unlike the Dylan version where the acoustic guitar reinforces the punchy regularity of the vocal, this version has the instruments responding to the vocal in a variety of ways, changing the harmony and phrasing from stanza to stanza, even line to line, as if the protest were arising not from one individual but from a community with many moving parts and multiple perspectives. The single’s success convinced everyone involved that they needed to make a whole album. The Hollywood sessions in April and September last year had the business-like efficiency of a jazz venture rather than the more leisurely pacing of a pop project. There was little discussion, rehearsal or arranging; the musicians would start playing and Williams would start singing.